Tyre maker Pirelli Tyres has been fined more than £500,000 after two employees were injured in separate incidents at its factory in Carlisle, Cumbria. Both accidents happened on the let-off machine, a unit at the start of the production line comprising a reel wrapped with rubber ply, and a bobbin. 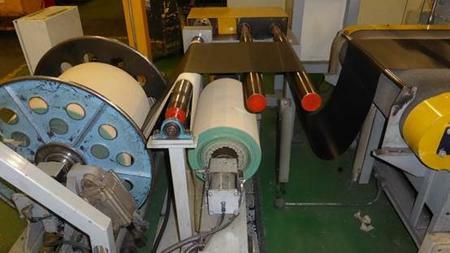 During operation, the rubber ply was fed on to the conveyor belt while the protective liner wound around the bobbin. On 29 November 2013, machine operator Paul Irons was manually adjusting the bobbin with the unit in the loading position. The machine was running at a production speed of 18 m per minute and he was drawn into the exposed in-running nip, sustaining a broken arm. After the accident Pirelli disabled the run-out function to ensure the machine could no longer operate while in the loading position. However, the nip-point remained unguarded. Matthew Tinsley, the Health and Safety Executive (HSE) inspector who carried out the investigation, said: “Pirelli reviewed the machine and carried out a new risk assessment. They took action in terms of disabling the run-out function, which would prevent the exact same accident happening again, but they missed that the nip was still accessible when it was in the production position.” As a result, employee Karl Davidson received similar injuries on 31 August 2015 when he was caught in the same in-running nip. The unit was in the production position and operational when he saw that the liner was not wrapping around the bobbin correctly. He attempted to rectify the issue but became caught in the nip point. “Pirelli reported both accidents to the HSE under RIDDOR but neither met its incident selection criteria and were not investigated. “With the incidents being the best part of two years apart and on the basis of the limited information provided by Pirelli, there was nothing to tell us they both happened on the same machine,” said Tinsley. Pirelli pleaded guilty to two breaches of reg 11(1) of the Provision and Use of Work Equipment Regulations. It was fined £512,000 and ordered to pay £5,820 costs at Carlisle Magistrates’ Court. After the sentencing on 25 September, Unite issued a statement in which it said Pirelli had a history of safety issues at the Carlisle factory. In making his sentencing remarks, District Judge Chalk noted that credit could not be awarded to Pirelli for a good safety and health record. He fined the company £12,000 for the first accident because it was before March 2015, when new legislation was introduced granting magistrates’ courts powers to issue unlimited fines for safety and health offices in England and Wales. See box below for how the judge applied the sentencing guidelines to the second offence.